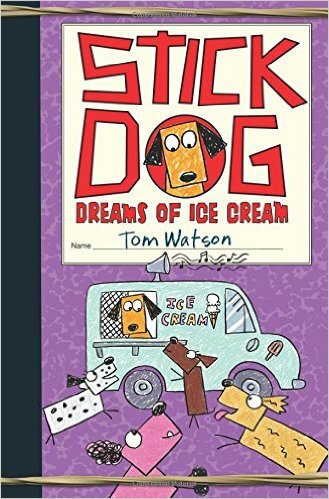 Stick Dog Dreams of Ice Cream is about a doodle dog named Stick Dog and his four friends named Poo-poo, Karen, Mutt, and Stripes. Stripes is my favorite character, since he actually has black spots on him! In this adventure, it is a hot dry day and the dogs are trying to find something to cool them off. First, the dogs find a water attacking machine. Then, while they are hiding in the bushes, a weird truck playing loud, annoying music comes by. The truck says "Ice" and Poo-poo knows that ice melts into cold water. But then they find puddles of ice cream! They love it and try to get into the ice cream truck. Will they succeed? This is the fourth book in the Stick Dog series and I really liked it. The dogs are always trying to hunt down some kind of food. I really liked this one because the dogs are coming up with crazy plans, like jumping off bridges, to get into the ice cream truck. I think this is, by far, the craziest Stick Dog book so far! I can't wait for the fifth book to come out.